The Healthy Home Trio is a 3-in-1 package that keeps the air in your home fresh, clean, and pure. As air enters the Trio, it is filtered with a MERV 13 filtration media. 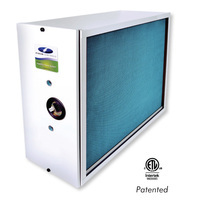 This pleated 4 inch filter traps particles as small as .3 micron including mold, bacteria, dust, dander, and pollen. After the filter, the air must pass through an ultraviolet C (UVC) germicidal treatment zone guarded by two powerful 24-inch UVC germicidal lamps. These lamps neutralize and destroy airborne microbes such as bacteria, viruses, mold, and fungi. The final phase uses patented PRO-Cell™ Technology, our exclusive Photo-Reactive Oxidation process. When the patented aluminum honeycomb cells are exposed to the UVC germicidal light, the PRO-Cell’s extensive surface area transforms the odors and volatile organic compounds (VOCs) into harmless, odorless water vapor and carbon dioxide. The PRO-Cell core is maintenance-free and never needs replacing. The Healthy Home Trio can be installed by your HVAC contractor over the AC-coil, in the return, or in the supply duct of your HVAC system. Step 1: MERV 13 High Efficiency Filtration traps mold, bacteria, dust, dander, and pollen. Step 2: UVC Germicidal Purification neutralizes bacteria, mold, and viruses. Step 3: Patented PRO-Cell™ Technology eliminates odors and VOCs.